Ramses: Tarot of Eternity based on the storyboard of Giordano Berti and painted by Severino Baraldi (a master of historical illustrations) is an Ancient Egyptian-inspired tarot, concentrating on a single era, 1304 to 1224 BC, and illustrating the time of the 'living god' - Pharaoh Ramses II. The Major arcana depict scenes from this historical period, beginning with the father of Ramses and ending with his son (3 generations). 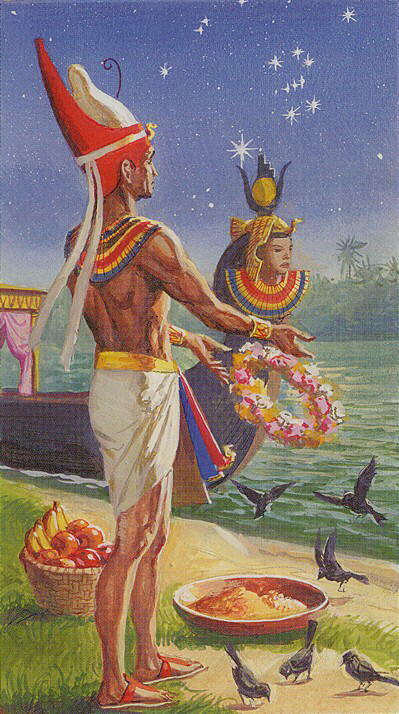 The Stars card shows a man offering a garland of flowers to the river gods before undertaking a journey. The King of Pentacles is quite amusing, with a fat, bald guy giving thanks to the gods for his cushion full of money, and the 2 of Chalices is beautiful � a couple embrace by the side of a river, watching the sun rise on the horizon, with ducks playing in the water and a cat sat beside their feet.